Maize silage (Zea mays L.) is made out of whole ensiled maize plants. It is one of the most valuable forages for ruminant livestock and it is used wherever maize can grow, from temperate regions to the tropics. The popularity of maize silage is due to several factors. It is a consistent source of palatable and high-energy forage for all classes of ruminants, including dairy cattle, beef cattle, sheep and goats (Roth et al., 2001). It is one of the most high-yielding forage crops, requires less labour (since it is harvested in a single operation) and is generally less costly (per t DM) to produce than other forage crops (NASS, 2015; Arvalis, 2011; Roth et al., 2001). Maize silage is also a good way to secure the crops as it is possible to turn a maize grain crop damaged by frost, rain or drought into maize silage (Arvalis, 2011; Roth et al., 2001). Though relatively easy to produce, maize silage requires good crop and harvest management as well as careful ensiling practices (see Processes and Forage management below) (Arvalis, 2011). Baby corn is a much appreciated vegetable that is increasingly consumed worldwide. Baby corn consists of immature cobs of maize plants harvested young, 2-3 days after silk emergence and before pollination. Baby corn can be obtained from the same hybrids as other maize crops, or from adapted hybrids that are shorter and develop several stalks (Indriani et al., 2015; Kaiser et al., 2011). Baby corn is a fast growing cash crop requiring only 55-60 days between planting and harvest (Srichana et al., 2014). Because it is harvested at an early stage of growth, the crop residues including stalks, leaves, husks and silk provide very good quality forage palatable to livestock (Indriani et al., 2015; Srichana et al., 2014). In the tropics, it can be grown all year round. In Thailand, baby corn production was over 276 000 t in 2013. As edible baby corn cob accounts for no more than 15% of the production, it can be assumed that the remaining 85% could provide more than 1 million t of forage (green matter) (Srichana et al., 2014). Baby corn forage can be fed fresh or ensiled. The technique consisting in preserving green crops in silos, similar to the sauerkraut process, has been used since the early 19th century in Germany, Scandinavia and the French Alps. In 1877, the French agriculturist, Auguste Goffart, popularised the technique in a book (Goffart, 1877) that was later translated into English (Brown, 1880). Shortly after this, ensiling green maize was introduced into the USA. In Northern Europe, however, the process only took off in the 1970-1980s after early maize hybrids were developed, enabling maize cultivation in cooler areas (Renoux, 2016). Today, maize silage is the major source of maize forage for livestock, largely replacing green maize forage. In France, for example, maize silage accounted for 20% of cattle diets in 2015 (for both dairy and beef cattle). The worldwide area used for maize forage is about 16.8 million ha (AGPM, 2015). The EU-28 was the major producer in 2015, with 6.1 million ha maize forage that included 1.2 million ha dedicated to biogas production (CEPM, 2015). European production of maize forage has steadily increased since 2000 from 4 million ha to 6 million ha in 2015 (AGPM, 2015). In the USA, the maize silage area was 2.51 million ha in 2015 (NASS, 2016). Maize forage should be harvested at 30-35% DM. The choice of harvesting time is a trade-off between yield, nutritive value and silage quality (Arvalis, 2011). The ideal harvesting time is when the plant has reached physiological maturity and is in the full dent stage. This generally occurs 50-55 days after cob silking and corresponds to a DM of 32-38% in the whole plant. This can be correlated with two visual indicators in the grain, the milk line (limit between the dent part and the liquid part of the grain), and the black layer (that is visible at the base of the kernel once complete maturity has occurred). Optimal time is when the milk line of the grain is situated between 1/3 and 2/3 of the grain from the top (see seed figure below) (Ashley, 2001). Once the black layer appears, the DM content is higher than 37% and the grain should be ground to prevent loss of digestibility (Ashley, 2001). A lower or higher DM content may result in poor silage quality. Low DM content due to early harvest results in low DM silage which may be bulky, thus reducing feed intake and animal performance (Hicks et al., 2004 cited by Johansson, 2011). A low DM content also results in nutrient losses (DM, water soluble carbohydrates and protein) during ensiling (leachates) (McDonald et al., 2002). A DM content of less than 30% increases the risk of bacterial and fungal spoilage (Johansson, 2011). Harvesting too late can cause a low nutritive value of silage because of poor starch and fibre digestibility (Giardini et al., 1976). Such silage may also have a low palatability, which may reduce DM intake (McDonald et al., 2002). Late harvest may result in heating problems because of insufficient packing conditions (Nadeau et al., 2010). To overcome this, late harvested maize silage should be finely chopped (UWEX, 2016). In some areas, frost may occur before harvesting the crop. If the maize plant remains green after frost, it is possible to wait till it reaches an adequate moisture content. If the maize plant was killed before it was ready for harvest, the crop may be left in the field to dry provided leaf loss is not excessive. If the maize is ready for ensiling it should be harvested immediately. A frosted maize crop may be too dry and require finer chopping and added water, or the addition of a wet forage during the ensiling process (UWEX, 2016). Under severe drought conditions, the maize plant may have a restricted growing season and should be ensiled early. However, if the stress is moderate, the plant can resume growth and produce new dry matter later in the season. Drought-stressed maize plants generally have a lower energy content and sometimes a higher protein content. Such plants may cause nitrate poisoning (see Potential constraints on the "Nutritional aspects" tab), but ensiling is known to reduce nitrate levels by 50% in comparison to green chop (UWEX, 2016). Efficient maize chopping is a compromise between fine chopping, which aims at improving silo compression (particles over 20 mm are normally undesirable), and coarse chopping, which increases nutritive value and limits the risk of acidosis. The quality of chopping is variable, depending on the harvesting, chopping and desiling machines. Average length of particles ranges from 8-10 mm to 11-15 mm (Battegay et al., 2013). Chopping equipment has been developed to increase particle length up to 26-30 mm while increasing digestibility through shredding. This process, called shredlage, is now used commercially in the USA and in Europe (Ferraretto et al., 2012). Silage management should result in a low oxygen concentration with an augmentation of carbon dioxide, leading to the creation of an acidic environment, in order to prevent microbial and fungal growth. Under optimal conditions, undesirable spoilage microorganisms will not grow. Good silage management is very important for preventing moulds and mycotoxins. There is a wide variety of silo types and ensiling practices. Poor silo management conditions include: inappropriate DM content of crop reducing final silage packing density; inadequate particle length; slow filling of the silo; imperfect sealing and compression; delay in mass pH drop; air penetration in ensiled mass; inappropriate unloading machinery and techniques. Poor ensiling conditions can expose the silage to risk of air penetration, heat damage of nutrients, and excessive proteolysis. They can favour development of aerobic spoilage microorganisms and the production of mycotoxins. Deleterious conditions are prone to occur at the edges of the silo if they are not adequately sealed, which can be difficult (Gallo et al., 2015). During silo filling it is necessary to use clean, new, good quality sheets to cover the ground and the silage. It is possible to use old sheets for double protection of the silo (above the first new packing sheet) (Sagot et al., 2014). After silo opening, oxygen becomes available to the exposed surface. The activity of yeasts and moulds resulting from the survival of fungal spores, or from a re-colonization, may reduce stability of ensiled material and favour potentially toxigenic fungi development (Gallo et al., 2015). Preventive procedures are necessary to reduce air penetration and guarantee good fermentation: particle size must be adapted to the moisture content (at a low moisture content, the particle size should be smaller) and silo size, especially the working face, must be adapted to the number of animals to feed, so that the open front is not exposed for too long between cuts. In Europe, it is advised to cut 20-30 cm silage every day, and the size of the silo must be calculated according to this recommendation and to the number of animals (Sagot et al., 2014). 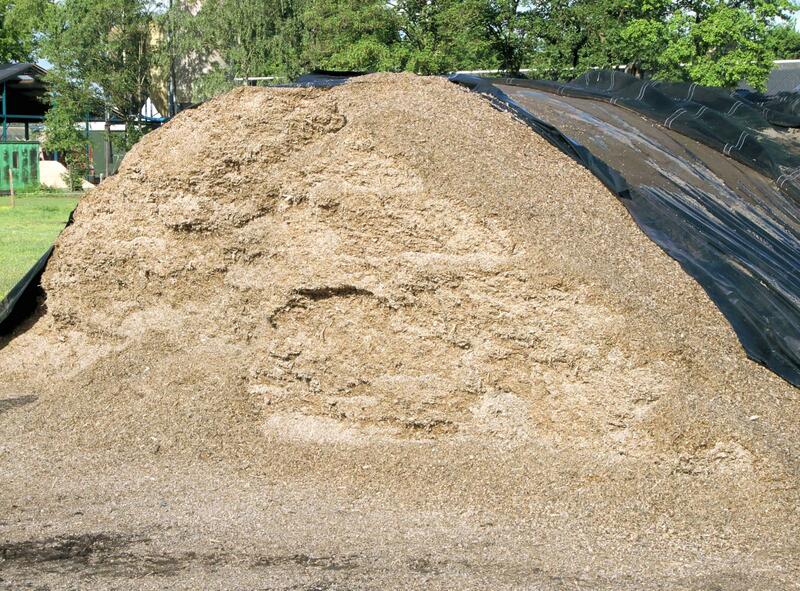 Compression of the silage must be complete and good quality polythene sheets must be used to cover the ensiled mass. The packed silo must then be put under adequate distribution of weight (heavy bags or car tires) on top to limit oxygen contact in the peripheral areas of the silo (Gallo et al., 2015). The maize crop provides higher yields than most other forages, in France between 12 and 18 t DM/ha, and in the USA an average of 15 t DM/ha. The development of maize hybrids has been instrumental in the worldwide success of maize silage, and the choice of a suitable hybrid is the most important factor for profitable silage production. The main criteria for selecting a hybrid variety are yield, precocity, and resistance to disease, pests and lodging (Delmotte, 2010). Stalk characteristics are usually modified with the aim of increasing the digestibility of the fibre in maize silage. Grain characteristics can be altered through modifications in nutrient or starch composition (Ferrareto et al., 2015). Some hybrids intended for grain production have high yield and high DM and fibre digestibilities, and are thus also suitable for forage production. Some leafy types have yields similar to those of grain types, but have softer kernels that dry more slowly. Such varieties may contain less starch and more fibre. Some leafy types were bred for silage production, while others have a faster drying rate, required for grain production. Brown Midrib varieties have lower yields and much higher fibre digestibility, but may be more costly. Waxy types have been used for silage but with inconsistent results (Roth et al., 2001). Some hybrids called "Stay-green" maintain leafiness and have a slower DM accumulation in the grain (Arriola et al., 2012). In the tropics, hybrids with late maturity are desirable to maximize yields. However, they require more water and have lower grain-to-stover ratios. Earlier-maturing hybrids use less water and generally have better grain-to-stover ratios. Under growing conditions in Hawaii, hybrids designed for silage are generally taller, leafier, more resistant to diseases and can be more densely planted than hybrids grown for grain (Brewbaker, 2003). Maize silage can be produced under traditional tillage, or under conservation tillage. In the first case, tillage incorporates all crop residues before sowing. Under conservation tillage systems 30% (or more) crop residues are left on the soil surface to limit erosion, water evaporation, and to reduce fuel costs (lower depth of tillage) and labour costs. Producing maize silage in conservation tillage systems can be more difficult. It is necessary to choose hybrids with high seedling vigour and to sow at a 10-15% higher seed rate because seed mortality is higher, and the seedlings have to penetrate the residue of the cover crop. The planting date must be adapted to suit the growing conditions. However, it is generally advised that maize intended for silage can be sown later than maize intended for grain, and at a higher seed rate for maximizing yields. In warm, dry seasons, maize crops require irrigation for maximum production whether for grain or silage production (UWEX, 2016). Maize crops drain nutrients from the soil, do not compete well with weeds after the seedling stage, and are subject to many diseases and pests. In consequence, the cultivation of high-producing maize requires high fertilizer levels as well as herbicides, pesticides and fungicides, which can be deleterious to biodiversity and soil conservation. Heavy fertilizer applications can cause nitrate leaching and soil erosion. Herbicides may contaminate the groundwater while pesticides alter biodiversity (European Commission, 2000). In developing countries, where fertilizers are too expensive for general use, the nutrient uptake is higher than when fertilizers are regularly used, thus reducing soil fertility and causing further soil degradation (CIMMYT, 2009). The debate about the environmental impact of GM crops is complex and a full discussion of the issue is beyond the scope of this datasheet. GM maize hybrids with insect or herbicide tolerance have been commercialised since 1996 and are highly popular in some countries (93% of planted maize in the USA in 2014; Ferrareto et al., 2015) because of their economic benefits, but their environmental impact has been the subject of considerable debate. Positive impacts have been reported for GM maize, notably a reduction in herbicide and pesticide use, with some benefits for wildlife (Edwards et al., 2009). However, potential negative effects have been alleged, including the alteration of the DNA of soil microflora, and deleterious impacts on useful insects such as butterflies and bees, or on non-GM plants (including maize) through genome transfer (Dale et al., 2002). Production of maize silage includes two major stages, chopping and ensiling. The Life Cycle Assessment (LCA) of maize silage production showed that the chopping stage was responsible for the major part of the environmental burden of maize silage (more than 88% for all the evaluated impact categories of the LCA), while ensiling is responsible for a smaller share of the overall impact (Bacenetti et al., 2015). Compared to maize silage stored in bunker silos, silage stored in silo bags showed lower environmental impact for all the evaluated impact categories (from -5% to -9%). Such a difference is mainly explained by lower DM losses occurring through the use of the bags (Bacenetti et al., 2015). Maize plants containing high amount of nitrates produce nitrogen dioxide (NO2) during the early stages of fermentation. This severely injures lung tissues and may cause sudden death. NO2 is heavier than air and thus tends to remain above the silo. It has a bleach-like odour and forms a reddish-brown haze. Maize with potential high nitrate content should not be harvested soon after rain ending a dry period. Ensiling in horizontal silos or in silo bags reduces the risk of NO2 intoxication (Bagg, 2012). Maize silage is a heterogeneous fodder that includes both starchy material (from the grain) and fibre (cell walls from stalks and leaves) in variable proportion, depending on genetics, stage of maturity and growing conditions (Peyrat, 2014; Roth et al., 2001). Maize silage contains about 25-35% dry matter. It is relatively poor in protein (5-10% of DM) and rich in fibre (15-27% of DM), with a highly variable starch content (18-37% of DM). It is low in lignin and lipids (about 2-3% of DM each). Maize cultivation requires large amounts of N fertilizer (inorganic or manure). Under some conditions, such as extended dry periods ended by rains, nitrogen may accumulate in the plants in the form of nitrates that are toxic to livestock. This is particularly true for the first 5-7 days after the rain (Bagg, 2012; Brewbaker, 2003). However, ensiling and good practices can reduce the nitrate level in the silage. Maize plants at the time of harvest should be neither too wet nor too dry, in order to promote good fermentation and reduce the nitrate content of the silage. A well-managed 3-5 week ensiling period can reduce nitrate content by 40%. Cutting should be done above the bottom third of the stalk, where most nitrates are present (Bagg, 2012). Aerobic spoilage may occur at various stages of ensiling (see Processes on the "Description" tab for prevention methods). Aerobic spoilage causes the development of Fusarium, Penicillium or Aspergillus fungi. The most important issue with maize silage is the development of Fusarium, which produces vomitoxin (DON), fumonisin, zearalenone, and T-2 mycotoxins. Aspergillus is a source of aflatoxins (Tapia et al., 2005). Penicillium roqueforti produces penicillic acid, known for its antimicrobial activity, which impairs rumen health and reduces feed intake. Penicillium roqueforti is also responsible for the production of the neurotoxin roquefortine C and mycophenolic acid, a potent immunosuppressant (Berge, 2011). Other Penicillium species produce patulin, which affects rumen fermentation and is both a neurotoxin and a cell toxin (Berge, 2011). Maize silage has become the predominant forage fed to ruminant livestock in many parts of Europe, Australia, New Zealand, North America and India, offered alone or as a complement to grass silage. Its main advantages are a high starch content, a high protein efficiency ratio and a relatively high content of digestible energy and nutrients (Fitzgerald et al., 1998; INRA, 2007; Keady et al., 2013; Malisetty et al., 2013). However, maize silage has a low protein content, which declines as maturity increases (INRA, 2007; Keady et al., 2013). 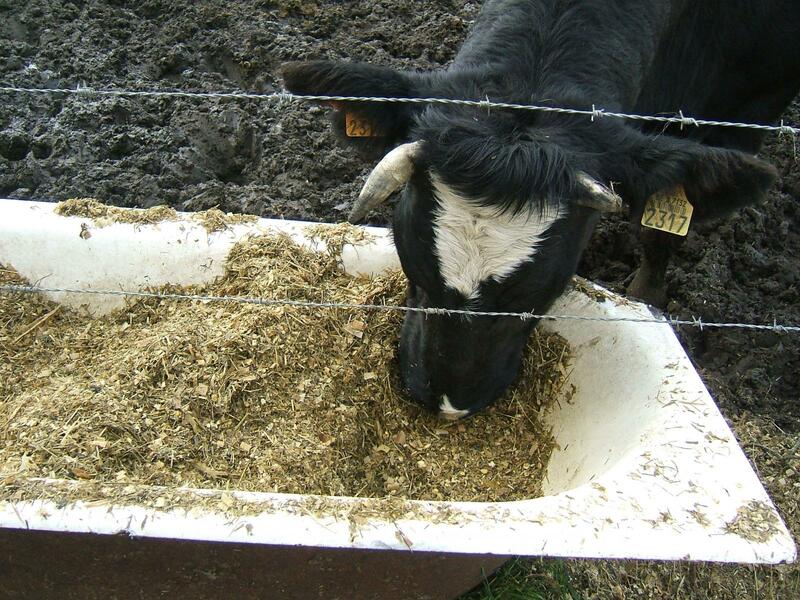 Diets including maize silage are usually supplemented with sources of energy and protein, particularly for high-producing livestock. The OM digestibility of maize silage ranges from 62% to 76%, depending on the growing conditions and on the stage of growth at harvest (Barrière et al., 2003; INRA, 2007). OM digestibility was also shown to vary between different maize hybrids depending on their earliness. OM digestibility was comprised between 72% for very early and 67% for very late hybrids (Michalet-Doreau et al., 1999). The amount and the composition of whole plant cell walls, especially their lignification, influence both digestibility and voluntary intake when maize is given as silage (Barrière et al., 2003). Starch is degraded slowly in the rumen, and differences among genotypes exist. Starch degradability also depends on plant maturity, decreasing from more than 80% to less than 50% when whole plant DM increased from 25% to 40% (Michalet-Doreau et al., 1999). In the case of baby corn husks, in vitro OM digestibility (83 vs. 79%) and ME content (10.2 vs. 9.2 MJ/kg DM) were higher for fresh baby corn husks, compared to baby corn husk silage (Bakshi et al., 2012). Voluntary intake of maize silage varies greatly. Well-preserved silages can be ingested at levels similar to the fresh or dry maize forages, but intake levels decrease with preservation quality. Badly preserved silages may have a low palatability. 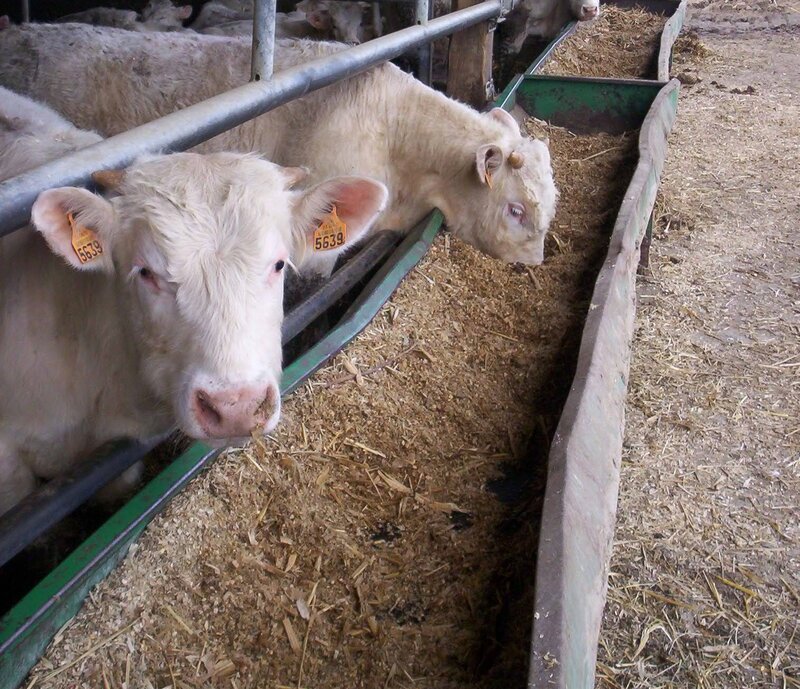 Acidity has a negative effect on maize silage intake in cattle, as it is generally negatively linked to DM content, and cattle, unlike sheep, are very sensitive to this. The low protein level of maize silage, when not supplemented, can negatively affect intake (Dulphy et al., 1996). In India, baby corn husk silage offered as a total mixed ration, with wheat straw and a concentrate mixture, to male buffalo calves, resulted in higher nutrient digestibility, voluntary intake and N retention than for fresh baby corn husks (Bakshi et al., 2012). The nutritional quality of maize silage can be improved through hybrid selection, benefiting dairy farmers through improved feed efficiency and milk yield. A meta-analysis of 48 papers published between 1995 and 2014 showed that intake, digestibility, rumen fermentation and lactation performance by dairy cows were affected by the type of hybrid ensiled (see Table 1 below). Hybrids selected for greater fibre digestibility increased milk and protein yield through a higher DM intake, but failed to improve feed efficiency and reduced starch digestibility. Lactation performance was little improved by non-GM hybrids and not improved at all by GM hybrids (Ferrareto et al., 2015). Table 1: Effect of maize silage hybrids on lactation performance of dairy cows (range of least square means; SEM in brackets), adapted from Ferrareto et al., 2015. A review of 34 comparisons in which grass silage was partially or totally replaced with maize silage, in diets for lactating cows, showed that maize silage significantly increased forage DM intake (+1.5 kg/d) and milk yield (+1.4 kg/d milk, +0.6 g/kg fat, and +0.86g/kg protein). Including maize silage in grass silage based diets could potentially reduce the concentrates needed by up to 5 kg/cow/d (Keady et al., 2013). From a series of experiments conducted in Ireland, it was shown that the inclusion of maize silage in diets with grass silage increased forage intake. However, the benefit in milk production depended on the maturity (starch content) and digestibility (greenness) of the crop when harvested (see Table 2 below). In particular, partially replacing a high quality grass silage with good quality maize silage (starch 20-25% of DM) increased forage intake, milk yield and milk protein concentration without affecting the efficiency of milk production. Moreover, the inclusion of 33% maize silage in the forage allocation achieved most of the increase in milk yield, but a higher inclusion level (67%) was required to maximize the yields of milk, fat, and protein. In practice a 50:50 mixture of maize silage and grass silage seemed to be near the optimum for milk production (Fitzgerald et al., 1998). Table 2: Effect of inclusion of maize silage on lactation performance of dairy cows (means; SEM in brackets), adapted from Fitzgerald et al., 1998.
a The animals were supplemented with 4-8 kg/d concentrate. A review of 9 studies in which grass silage was partially or totally replaced by maize silage showed that maize silage significantly increased forage DM intake (+1.5 kg/d) and growth of beef cattle (+0.23 kg/d live-weight gain; +0.11 kg/d carcass gain; +12 kg carcass weight). When offered ad libitum as the sole forage, daily carcass gain was increased by 31% due to a combination of increased metabolizable energy intake and improved efficiency of metabolizable energy utilization. Finally, a potential concentrate sparing effect of up to 2.4 kg/d/beef cattle was reported when maize silage was included in the diet. The effect depended on the level of maize included in the diet and on the crop maturity at harvest (Keady et al., 2013). In many sheep-producing areas of Europe, animals are housed during the winter feeding period and offered ensiled forage. Few studies have been undertaken to evaluate the effects of maize silage on the performance of pregnant ewes or finishing lambs. However, its low protein content may impact its ability to meet the protein requirements of animals with high requirements. A review of studies conducted in the UK concluded that maize silage can replace high-feed value grass silage in the diet of ewes in mid and late-pregnancy (see Table 3 below). Maize silage, whilst low in protein, can be offered as the sole forage without protein supplementation until late pregnancy (final 6 to 7 weeks). Increasing the maturity of maize at harvest tended to increase lamb weaning weight by 1 kg (Keady et al., 2013). Table 3: Effect of maize silage maturity and grass silage feed value on ewe and lamb performance (range of least square means; SEM in brackets), adapted from Keady et al., 2013.
a The animals were supplemented with 0 or 200 g/d soybean meal, and/or 5 to 25 kg concentrate (total concentrate during late pregnancy). Regarding finishing lambs, increasing maize maturity at the time of ensiling (and therefore decreasing starch content) improved carcass gain. Maize silage replaced medium and high feed-value grass silage in the diet, resulting in equivalent or improved daily carcass gain, respectively (see Table 4 below). Replacing medium feed-value grass silage with maize silage resulted in a potential concentrate sparing effect of up to 0.48 kg/lamb/d (Keady et al., 2013). Table 4: Effect of forage type on lamb performance (range of means), adapted from Keady et al., 2013.
a The animals were supplemented with 0.3 to 1 kg/d concentrate. Farmers in India are showing increasing interest in preparing and feeding maize silage based rations to their ruminant livestock, particularly small ruminants such as growing sheep, in order to obtain optimum body weight. Maize silage was successfully supplemented, either with alfalfa hay, groundnut haulms (to meet 25% of DM requirement) or a concentrate mixture at 1.5% of body weight, in order to obtain optimum growth rate in Nellore ram lambs (Malisetty et al., 2013). In Malaysia, the inclusion of increasing proportions of maize silage to elephant grass (Pennisetum purpureum) silage increased DM intake and growth performance of goats. The highest growth rate and OM digestibility were in goats fed 100% whole maize silage (see Table 5 below; Khaing et al., 2015). Table 5: Effect of inclusion of maize silage in the diet (60% forage, 40% concentrate) on the performance of goats (means; SEM in brackets), adapted from Khaing et al., 2015. In a preference trial, fermentation products of maize silage were affected by aerobic contamination, which had strong impacts on feed intake and preference by goats, evidenced by a decrease of DM intake after four days of exposure to oxygen. During 3h preference trials (2-way combination of maize silage and alfalfa hay), intake decreased from 651 g DM of maize silage (for 0 days of exposure) to 464 g DM of maize silage (with 8 days exposure). However, it was difficult to attribute the decline to a single cause. It was recommended that silage exposure to oxygen be limited during storage and feeding as much as possible because of its detrimental effects on intake (Gerlach et al., 2013). Because of its high fibre content, maize silage is not recommended for growing pigs. However, it can be used to feed gestating sows and gilts over 110 kg. Maize silage fed to gestating sows reduced feed costs by 20% and increased the number of piglets weaned (Pickett et al., 1965). Maize should be harvested when the cobs are formed and should not be too mature as it becomes less palatable. Silage should be finely chopped so that sows do not select between stalks, cobs and grain. Silage should be free of moulds. Intake can be as high as 4.5-5 kg/head/d, requiring about 1.25 kg of supplementary feed (Blair, 2007). Maize silage is well accepted by rabbits (Brazhnikov, 1983; Piatek et al., 1986). However, it is not frequently used in practical rabbit feeding, most probably because of the labour necessary to distribute small quantities of silage to small animals such as rabbits. In an Egyptian study, maize silage offered ad libitum to growing rabbits, as a supplement to a concentrate, represented about 12-13% of the total DM intake. Growth rate was between 17.9-19.5 g/d, similar to that obtained with other forages, such as fresh or ensiled berseem, or sugar beet top + berseem silage (El-Ayouty et al., 2000). An early study found that DM digestibility of maize silage was low (55%) and crude protein digestibility high (79%) (Brüggemann, 1939 cited by Voris et al., 1940). This high protein digestibility was confirmed more recently in the Egyptian study cited above (El-Ayouty et al., 2000). However, this apparent improvement of protein digestibility after ensiling was possibly the consequence of true protein degradation during fermentation and partial transformation of amino acids in completely digestible but poorly recoverable ammonia, as was observed with alfalfa silage (Perez et al., 1990). Hicks, D. R.; Thomison, P. R., 2004. Corn management. In: Smith, C. W.; Betrán, J.; Runge, E. C. A. (Eds), Corn: Origin, History, Technology, Production. p: 481-522. John Wiley & Sons, Inc.
NASS, 2015. Crop production: 2014 summary. USDA, Nat. Agric. Stat. Serv. NASS, 2016. Crop Production 2015 Summary. USDA, Nat. Agric. Stat. Serv.